Indian Skipper Virat Kohli’s statue was damaged when fans gather to the attraction to take selfies just after the wax statue was unveiled at Madame Tussauds in New Delhi on Wednesday. The right ear of the Virat Kohli's statue was damaged when fans were taking selfies with Indian skipper because of this statue had to be taken away within a day because of damage at the Delhi studio of Madame Tussauds. 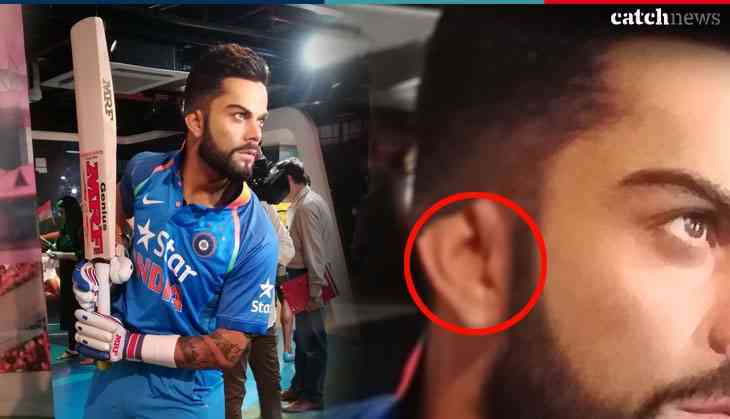 According to the reports "Kohli's statue ear was damaged due to some reason. We have fixed it immediately and fans are most welcome to visit the museum to take the photos with the India captain's statue,"
Kohli's figure was designed from over 200 measurements and photographs taken during the sitting session.Virat Kohli's wax statue joined other sporting legends including Sachin Tendulkar, Usain Bolt, Kapil Dev and Lionel Messi. Madame Tussauds is a museum which has wax statues is an attraction that portrays the fascinating world of entertainment, sports and politics under one roof. This museum was founded by wax sculptor Marie Tussauds in London and now museum has smaller version in other's cities also.